On October 19th, developer Wilbur F. Breslin, along with dignitaries such as Westchester County Executive Robert Astorino, State Senator Terrence Murphy, Yorktown Town Supervisor Michael Grace, Westchester Legislator John Testa, President of the Yorktown Chamber of Commerce Eric DiBartolo, Yorktown Director of Planning John Tegeder, and many others gathered to celebrate this community milestone. 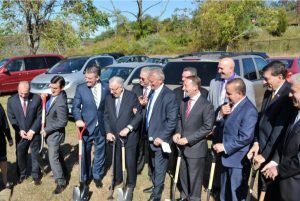 The 124,000 square foot Lowe’s will be located on 24 acres at 3200 Crompond Road (Route 202), at the northwest corner of the Taconic Parkway. This new retail development will also include three pad building retailers, and is scheduled to be open for business in the first quarter of 2019. Lowe’s Home Improvement is the second largest hardware chain in the United States and globally. They have over 1,840 stores throughout the United States, Canada, and Mexico. For leasing information at this exciting new shopping center, please contact Wilbur F. Breslin at (516) 741-7400 ext. 223, or Robert Delavale at (516) 741-7400 ext. 230.